The past week I took a good, old-fashioned vacation with my family to Ocean City, Maryland. While there I got some much-needed sun, lost my phone in the Atlantic Ocean, and finally got the chance to do some reading for pleasure, a hobby of mine that has gone by the wayside since starting college. The first thing you realize while reading this is that Dickey is a very intelligent man, far from your typical jock in the sports world. He was an English Literature major at Tennessee, which clearly shows in his smooth telling of his stories. It comes off as if he is talking directly with you rather than writing. Dickey is the definition of a baseball journeyman. After he was selected in the first round of the MLB Draft in 1996 by the Texas Rangers, his career almost never got off of the ground when a post-draft physical showed that his elbow was missing an ulnary collateral ligament. Rather than take a risk on him, the Rangers took off more than $800,000 worth of bonus money from his deal but still signed him. The book then dives into Dickey’s next 14 years of toiling in the minor league ranks and bouncing from organization to organization, as refused to give up his dream of becoming a regular major league pitcher. He turns to the knuckleball in 2006, and his relentless working with the pitch turns out to be a career-saving move. It culminates with his 2011 season, in which he finally gets his shot with the New York Mets, in which he puts together a solid season, his first full one in the majors at the age of 36. The book goes far beyond baseball, however, which is why it is such a great read. Dickey’s story about his career alone is incredible, but the book also goes into his struggle with coming to terms with his past in order to move forward with his life. His rough road early in life includes being born into a broken home and being raped by a babysitter at just eight years old. Dickey talks about the struggle of dealing with these problems, and how trying to hide away from them as an adult almost cost him his marriage and even his own life. In what he calls his “search for authenticity” in life, he comes to terms with his past demons and coincidentally finds happiness and baseball success once doing so. He goes into detail about his Christian faith and the role it played in his life, but it doesn’t come over as preachy. I can’t recommend this book enough for a variety of reasons. First, it comes off as a great self-help book for anyone that has had doubts about themselves at any point. While we may not have suffered the atrocities that Dickey has in his life, his struggles of continuing to believe in himself while reaching dead end after dead end is something everyone has experienced. Also, given the situation at Penn State, the book provides perspective as to what the victims of sexual abuse go through, and how it isn’t easy to just be forward about it. I finished the book in no time and was glad I picked it up. Dickey is having an incredible 2012 season despite being 37 years old and was just named to the All-Star Game for the first time in his career. I highly suggest you jump on the R.A. Dickey bandwagon, and a great start is picking up this book. After turing in the dreaded Precision Language final early Thursday morning, I was free for the summer. After packing up and heading home, it was time to start enjoying my summer. 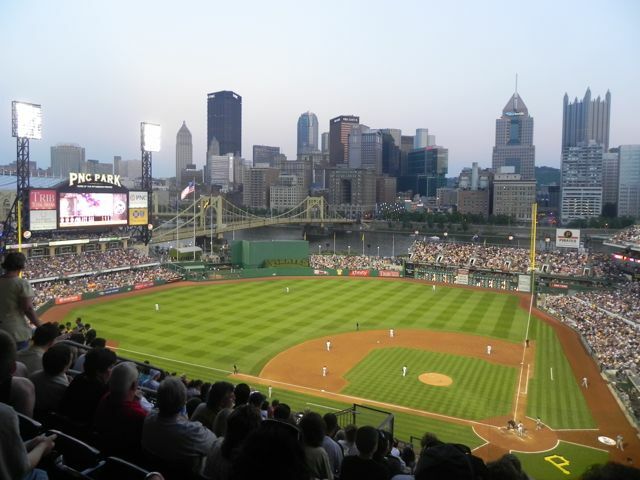 Lucky for me, the Pirates were wrapping up a season-long home stand with a four game series against the New York Mets. I have attended all games in a three game set before, but had never completed a four-game series. Here is a recap. Back in the friendly confines of PNC Park for the first time in nearly 50 days (that’s a long time for a season ticket holder). It felt good to be back at my summer home. 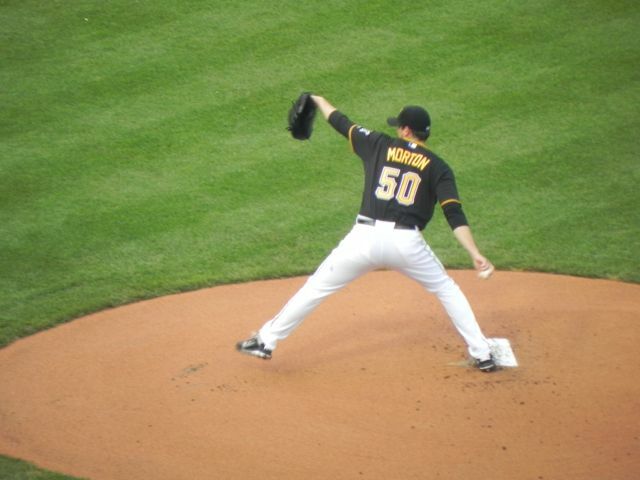 There was no one that I would rather have pitching my first game back than Charlie Morton. 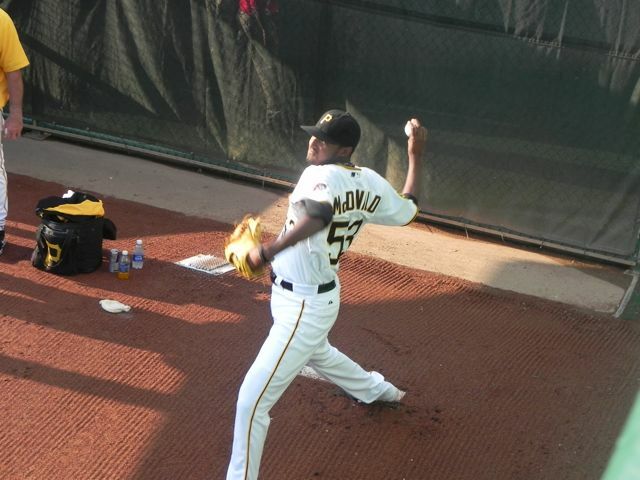 He has been dynamite in 2011 for the Pirates, and he is always fun to watch. This night, however, the luck wouldn’t be on his side. The Mets took control early, and scored five runs in the fourth where every ball seemed to either drop in for a hit, or cause the Pirates to make an error. The offense that is suffering from many injuries couldn’t get anything started, and the Mets cruised to an easy 8-1 victory. 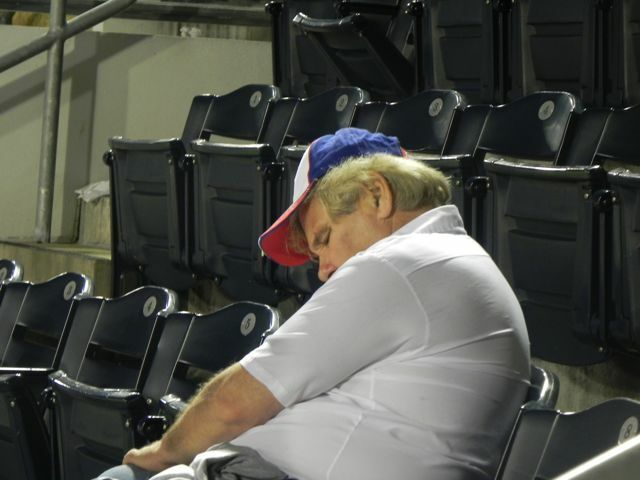 This guy, however, was put to sleep by the Pirates offensive woes. The next day’s game would be much more event-filled. 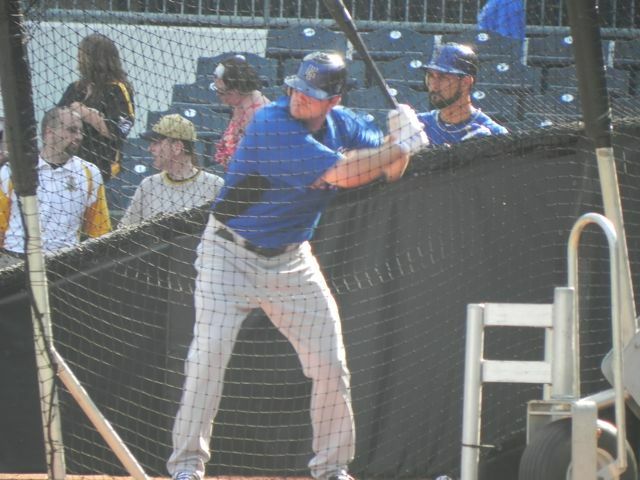 I hadn’t gotten to see much batting practice so far in 2011, but today I got my chance. The gates opened at 4:30 for season ticket holders, and unlike other days, STHs get access to the whole bowl rather than just the bleachers. Since many had their sights focused on getting home run balls in left field, I picked the deserted seats down the third base line to get some snags. I got my first ball shortly from pitching coach Ray Searage. Since the ball was close to where I was standing, and there was nobody else around, he had no choice but to throw it to me. At the same time, Jeff Karstents was trying to chuck some balls up to a kid with his mom in a suite in the upper deck. Since he came up short, the ball made it’s way down to me. I was able to throw it up to them. unbeknowst to me, there were some other kids up there too who also wanted balls. This is a nightmare for a ballhawk. Since I didn’t have any emotional attachment to the Searage ball I had a minute ago, I sent that one up. Pedro Ciriaco hit a ball into the 100 level seats down the line. A usher directed me to it, and it was ball number two on the day. 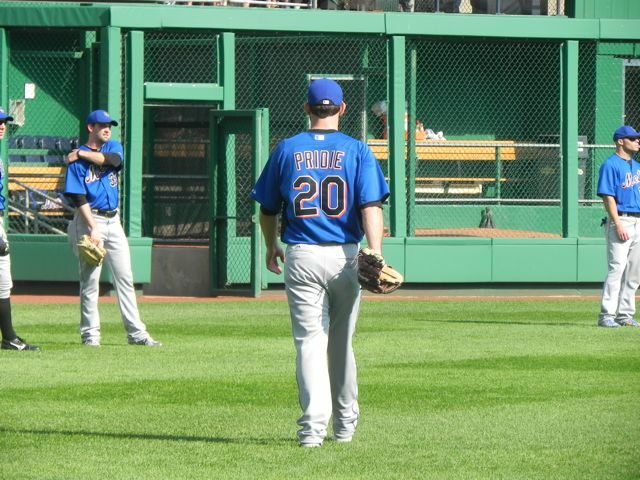 The Pirates ended practice shortly after, and the Mets came out to hit. I was still the only person down the baseline. Jose Reyes was the first to hit, and sent one of the first pitches he saw just over my head down the line. It landed in a seat a few rows back and I was able to pluck it up for ball number 3. Since the Mets players were ignoring the kids up above me, they began to call on me to throw yet another one up. Thinking on my feet, and not wanting to look like a jerk, I reached into my bag and threw up the Ciriaco ball. I didn’t want to get rid of the Reyes one I just got, he’s one of the best players that I’ve snagged a ball from. 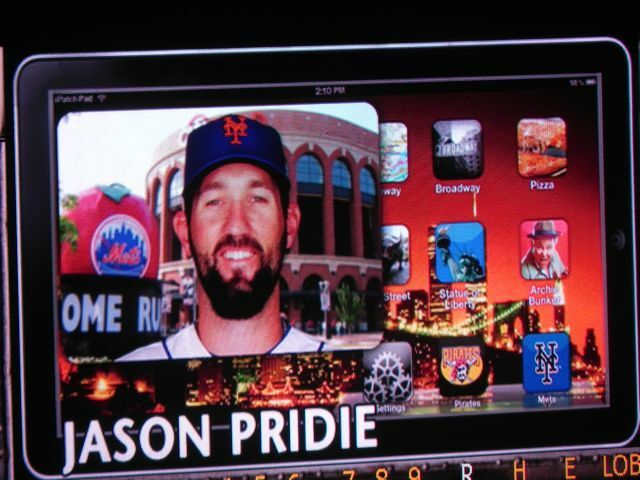 Jason Pridie of the Mets saw my act of goodwill and hooked me up shortly after. With four balls on the day snagged, I got closer to the hitters to get better shots of them hitting. After a little while, sluggers Jason Bay and Carlos Beltran were due up. 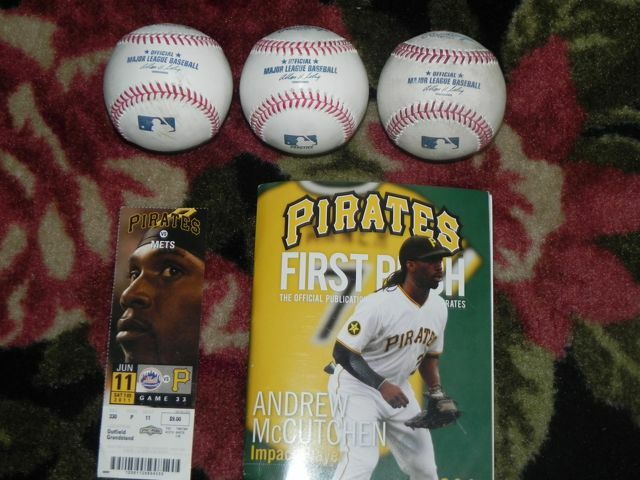 I went out to the outfield seats to attempt to tie my career high of five baseballs. I played the less crowded right center field seats and waited for Beltran to hit one my way. He crushed a ball that I began to break back on toward the Riverwalk. I had overrun it and it was dropping short of me. A man with a glove dropped it into a handicapped seat at the top of the section. Another guy grabbing it pushed it to the seat where it rolled out. I got down and trapped it with my glove. A crazy fumblerooski to get my 5th ball. I went to the bullpen to watch the pitchers warm up. 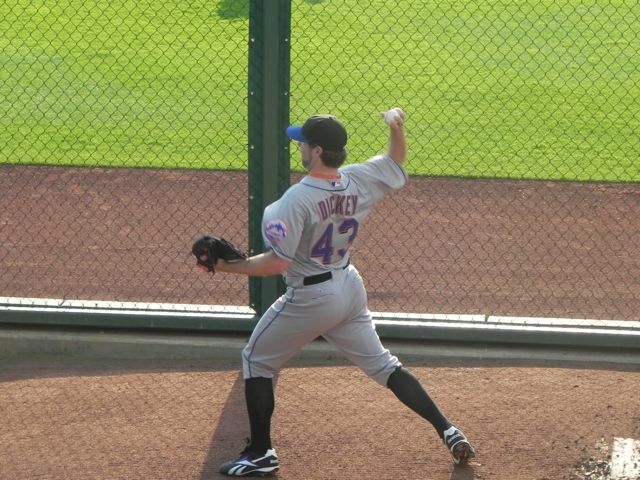 The game featured an intriguing pitching match-up with the hard throwing James McDonald of the Pirates going against Met knuckleballer R.A. Dickey. I went to my seats to watch the game. 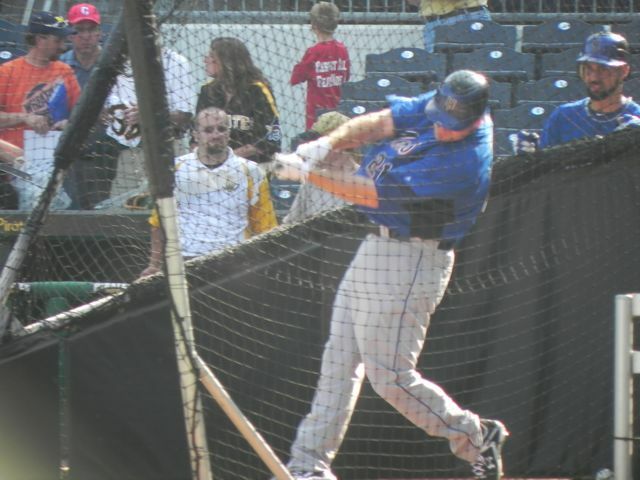 It would be the first that Jason Bay had played in Pittsburgh since being traded in 2009. I could not understand for the life of me why Pirate “fans” booed him. He was always a class act and an all-star here. He never really did anything that ticked me off. Later in the game I moved to seats closer to my parents who were attending the game. 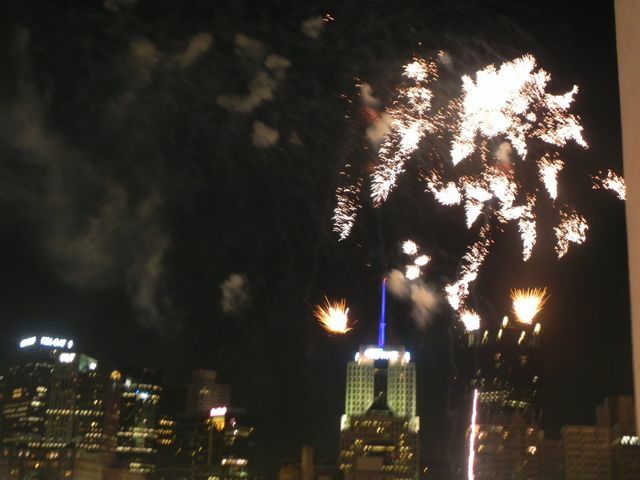 The third largest crowd in PNC Park history was on hand, primarily to see the post-game Skyblast show featuring the band Huey Lewis and the News. The Pirates were able to get just enough offense. A two-run double by Andrew McCutchen was the difference. Despite getting hit hard, and struggling with his control at times, McDonald was able to keep the Mets in check. Since all of the 39,000+ were sticking around, the atmosphere was really electric as Joel Hanrahan mowed down the Mets in the 9th to preserve the 3-2 victory. The show after the game didn’t disappoint either. If you have never been to a Skyblast show before, I highly suggest you check one out. It is a big pyrotechnic extravaganza featuring fireworks and live music. 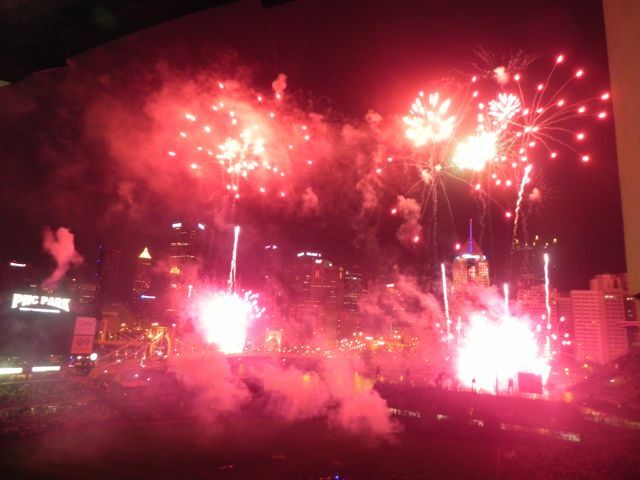 There were fireworks from every place you could imagine including the field, the barges on the river, the Roberto Clemente bridge, and the scoreboard. Some were even fired off of the skyscrapers across the river. Huey Lewis had a good show, though I wouldn’t rank it at the top of the ones I have seen. I must say I am really looking forward to when Train comes in August. There aren’t many better ways to spend seven dollars. Here is my pull. I noticed how the balls the Mets used had the logos way off center and crooked. Yeah it was another forgettable game after a very good one the night before. Kevin Correia pitched very well, but came unglued in the 8th inning when the Mets blew the game open. 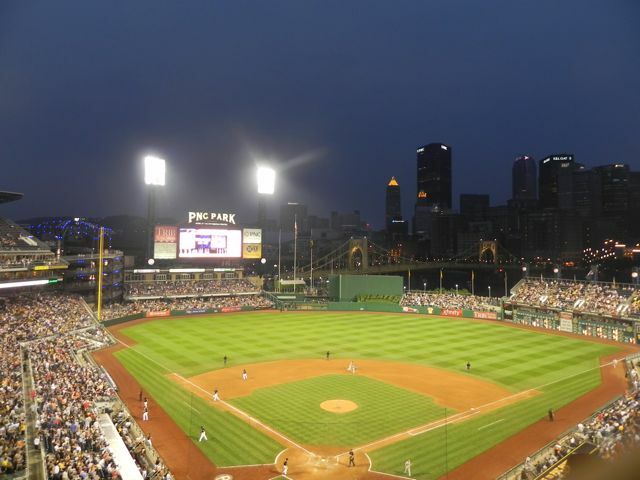 The only excitement for the Pirates on offense came when Lyle Overbay flew out to deep center field. The firework controller thought it was a homer but it wasn’t even close. He launched them by mistake. Clint Hurdle was ejected after arguing that the center fielder Angel Pagan trapped the ball against the wall. It was yet another great day for baseball so it wasn’t a complete waste. I could see the finish line. Attending four games in four days is quite a grind, and Monday’s would be the last one needed to complete the task. 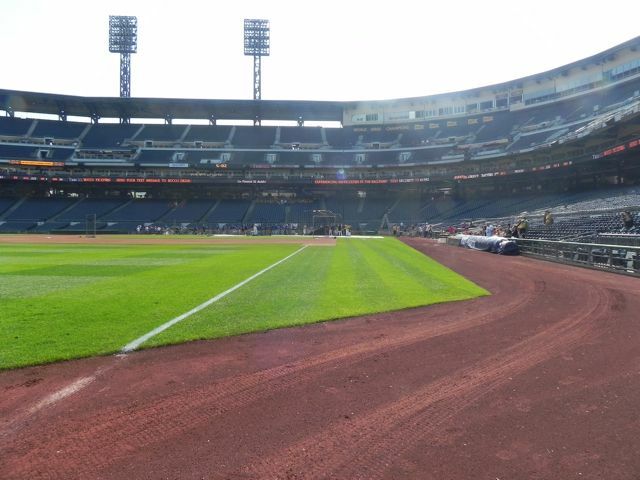 I wasn’t feeling batting practice, so I headed to the stadium for first pitch. 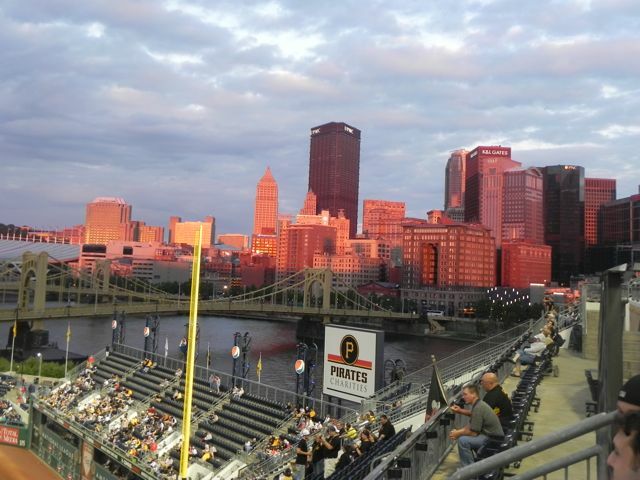 It was a cool night that was dominated by another great outing from Pirate pitcher Paul Maholm who mowed down the Mets. I was also very impressed by the play of new catcher Mike McKenry who was acquired from the Red Sox just hours before the game. There were a couple of crazy plays including fielder interference that led to the first Pirate run, a home run by Brandon Wood, and a near triple play. Hanny shut it down for the 17th time in 17 chances. He’s quickly becoming one of my favorites. The game went very quick as it wasn’t even dark yet when the game was in it’s late stages. The city had a weird orange tint as the sun set. I saw some good and saw some bad in my first game back, and I am looking forward to spending many more summer days and nights at the ballpark.